US Soccer supporters cheer after Landon Donovan scores a goal for the US. 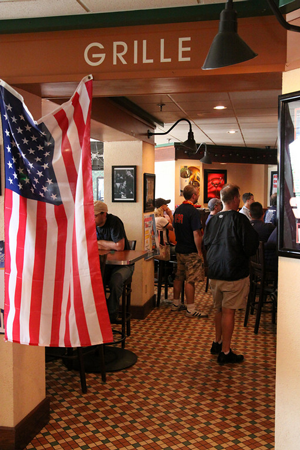 The Sweetwater Bar and Grille is the place to watch all your US Men’s National Team World Cup games. 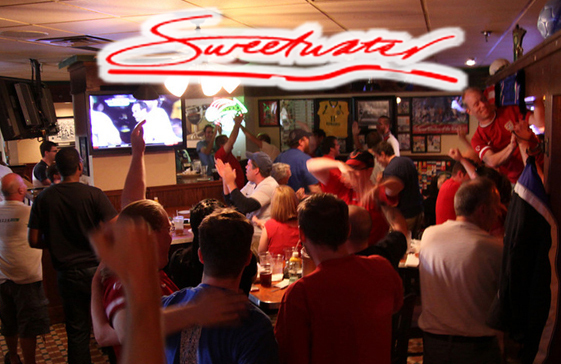 In fact the Sweetwater is the place to watch all the FIFA 2010 World Cup games. ALL FIFA 2010 World Cup games will be shown LIVE with breakfast and lunch specials. Can’t make it down to watch the games live? Replays will be shown after 5:00 pm. Saeed Ghasemi, owner of the Sweetwater has created a welcoming environment for football/soccer fans. He’s filled his restaurant and bar with big screen TV’s and receives Direct TV, Dish Network and even MLS Direct Kick. In fact the Sweetwater has a computer wired to the TV’s so you can watch a match from ESPN360 if you’d like. No matter what your soccer interest, just give Saeed a call and he’ll make sure it’s playing for you. 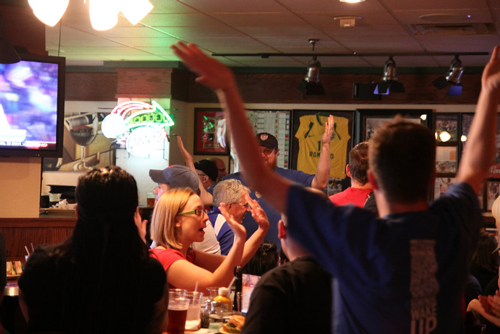 You won’t find any other bar in the Twin Cities more accommodating to soccer fans than the Sweewater. The Sweetwater was voted best “Soccer Bar” in the Twin Cities by City Pages in 2007, was featured in the Star Tribune during the 2010 World Cup as one of the top place to watch soccer, and featured in US Soccer’s official Blog during the World Cup. The Sweetwater is an official U.S. Soccer Bar and is the place to watch all USMNT games. The Sweetwater Bar and Grille is located in the Kelly Inn at 161 Saint Anthony Ave Saint Paul, MN 55103. Tel: (651) 227-8711l. There’s plenty of free parking. To read the story of how the Sweetwater grew to it’s current popularity with soccer fans please read this article. 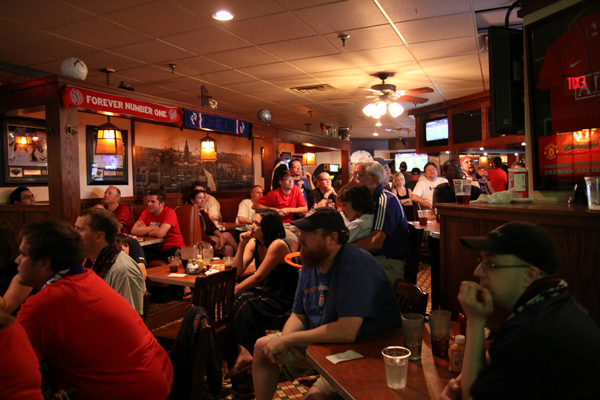 Soccer fans watch one of the 10 TV’s in the Sweetwater. Not a bad seat in the house. *Check with your server before ordering.